Battle of the Belmont Bands kicked off its fifth year Saturday with an impressive array of student talent, both current and alumni. Air Ralley, who ended the night as the battle’s winners, gave a performance that was solid from start to finish. They were the first band of the night that performed like a truly cohesive unit, which made them all the more fun to watch. The instrumentation was locked-in and impressive, and every member had an excellent grasp of the material and how their part fit into the band’s overall sound. They even performed a faithful and rocking cover of “When You Were Young” by The Killers that got a noticeably large portion of the crowd up on its feet for the first time of the night. However, Blackwood Row gave the night’s standout performance. The seven-piece outfit had a folk-rock sound that carefully and thoughtfully utilized every musician’s talents in a well-blended and unique way. But the highlight of their performance — and arguably of the entire show — was their cover of The Eagles’ classic “Hotel California,” sandwiched between the iconic opening melody of The Rolling Stones’ “Paint It Black.” It was a shining example of everything a cover should be: creatively reimagined to fit the band’s sound, confidently executed and lots of fun. The show kicked off with a performance from freshman twins Mary and Brianna. They sounded a bit like old Taylor Swift, which, after Thursday night’s release of “Look What You Made Me Do,” was a much-needed and refreshing trip down memory lane. Their set included a solid piano ballad and an Ed Sheeran cover, both showcasing the duo’s vocal power and cohesion. Their set as a whole was particularly impressive for students who have only been at Belmont for two weeks. It will be a lot of fun to see how these two grow as artists over the next four years. Talia was the second performance of the night. Her songs fit right into the pop genre she seemed to be aiming for, and had tones of a more soulful Lana del Rey. Her backup band was simple but served her performance well. She gave a good cover of “Crazy” by Gnarls Barkley, though the backup dancers with batons entering the stage during the song were confusing. I appreciated her attempt at adding a visual component to her performance and livening up the show. However, with almost no synchronized choreography, the spectacle was more of a distraction than anything else. The Bella Hudson band delivered enjoyable country rock. It was great to see Hudson playing guitar along with her bandmates, who were clearly great instrumentalists themselves. Her originals and a tasteful Miranda Lambert cover rightfully brought the audience up towards the stage to join her. Throughout the performance, Hudson’s band looked like they were genuinely having a great time — not just trying to act like it. Life in a Tree was also a lot of fun to watch. They used clever tastes of ukulele, and a unique Panic! At the Disco cover supplemented their originals. The highlight of their performance was certainly the vocals, which were powerful, soulful and smooth. Their chill, indie-pop songs were a great closer for the student bands and a good transition into the Lonely Biscuits. Unsurprisingly, The Lonely Biscuits were an excellent headliner. It was sweet to watch them perform right outside the doors of Maddox Hall, where the band first came together. Their songs were beachy, indie-pop and brought the largest crowd of the night front and center. As promised, their performance was full of energy. The Biscuits were a ton of fun to watch and closed 2017’s BOTBB with a bang. Make sure to catch them opening for Judah & the Lion at the Ryman Auditorium September 9 and again at Grimey’s for an in-store EP release show September 22. The biggest disappointment of the night was by far the sound. The balance of instrumentation was way off — barely anything blended and none of the instruments stood out when they should have. Instead, the mix sounded muddy and unnecessarily loud, which detracted from the performances as a whole — bands with acoustic instruments unfortunately had the toughest time with this. It was both disappointing and unfair to the student acts, most of whom had wonderful songs which we struggled to enjoy fully because of the poor mixes. It wasn’t until Air Ralley took the stage — the fourth band of the night — that the mix seemed to marginally improve. 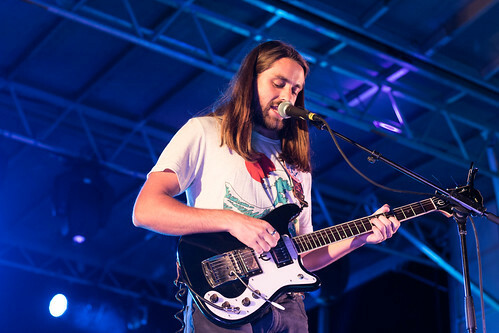 Overall, standout performances from Blackwood Row, Air Ralley and The Lonely Biscuits made for a great night of music out on The Lawn. I can’t wait to see next year’s show. Photos by Carina Eudy and Hunter Morgan. Article written by Sara Scannell.